During the winter months, adults and children alike look forward to seasonal fun such as skiing and snowboarding, ice skating, and even just walking, hiking and running in a winter wonderland. Yet with these fun outdoor pastimes come seasonal orthopedic risks. As every orthopedic surgeon knows, orthopedic injuries spike after a heavy snowfall. Winter injuries can range from mild and easily treatable to severe and long-term – the types of injuries that generally require immediate attention from an orthopedic surgeon. So, before you head out to any winter games, chores, or other activities in the cold weather, it’s important to be aware of injuries that are common during this time of year, and how to avoid them. A study conducted by the US Consumer Product Safety Commission ranked injuries from winter sports by volume. Snowboarding accounted for the most injuries, followed by downhill skiing, sledding and tobogganing, and ice skating. For starters, never engage in winter sports without the company of a friend or companion. Always carry a cellphone to call for help in the case of an emergency. You should also be physically warmed up and dressed in the necessary protective gear for your winter sport. Before you begin, inspect your equipment to ensure reliable performance throughout the course of your activity. Stay hydrated and refrain from overexertion; a lot of the injuries that orthopedic doctors treat are caused from excessive strain in the final run of a game or activity. When sidewalks, driveways, stairwells, and patios are paved with ice and snow, people are more vulnerable to slip-and-fall injuries. Wounds to the head are common during winter falls, as are wrist and hip fractures. Therefore, it’s wise to avoid the outdoors on icy days unless you must go out for something. When you do go outdoors, wear footwear with rubber traction and take slower, shorter steps wherever you walk. Shoveling snow is one of the most loathsome winter jobs. It can take a long time and often requires a lot of physical exertion. 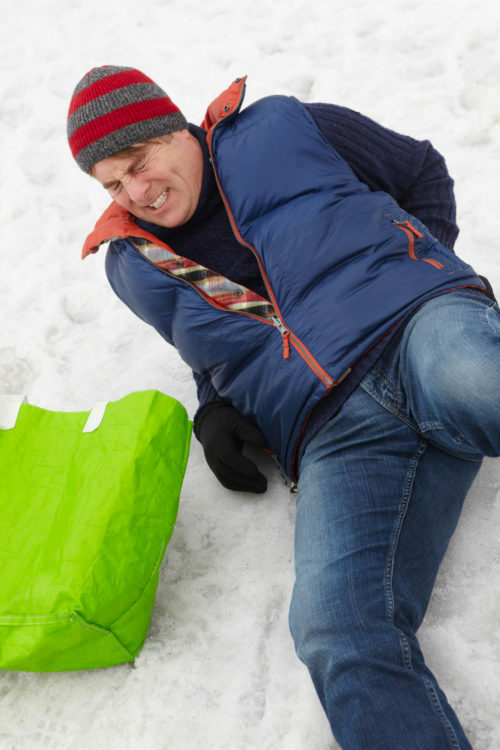 It’s not unusual to experience muscle strain when shoveling snow or scraping ice off the car. Most of us must carry on with work and normal activities, even after a snowstorm. Wet pavement, sleet and slush, and coverings of snow and ice can make roadways dangerous. Take proper safety precautions to avoid winter-related vehicle collisions. It’s important to first access the severity of the injury. Sometimes muscle injuries can be treated with ibuprofen and by applying ice. Always follow-up with an orthopedic physician is pain and swelling don’t subside. More severe injuries will need to be assessed and treated immediately by an orthopedic surgeon and may require a trip to the nearest emergency department for diagnostic tests, including X-rays or an MRI. Educate yourself and your family about potential winter incidents and accidents and you’ll be more prepared to prevent them. Follow these winter injury prevention tips and enjoy a safe and happy winter season.